Quite a blast from the past – the 800 x 600 in 256 colors (out of a great palette of 262144 colors!) was more or less the greatest graphic card which you could get for PC at that time. And the first version was running on a VT100 terminal with an additional graphics board. Sadly, I don’t have that code anymore :(. Oh, command line parsing, the old enemy of mine! In ye olden days, when I was learning Pascal, I did some programming on VAX/VMS systems, where you could (and should) leave the job of command line parsing to the DCL – the command line interpreter (something like CMD.EXE on Windows). You just wrote a definition file (see example on the right, found on the web) and DCL did the rest. Since those days I hated that I have to parse command line programmatically. Sure, there were parsing libraries – and I wrote few of them myself – but I was never happy with them. There was always too much code to write. Then I was looking for good examples on using attributes in Delphi and suddenly it occurred to me that I could use them for command line parsing, too! And that’s how GpCommandLineParser was born. 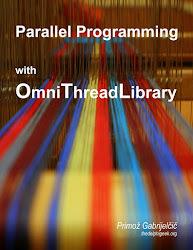 Before continuing, I should mention that I have based it (concept-wise, implementation is all my own) on the CommandParser unit, which comes with Delphi and can be found in Samples\Object Pascal\Database\dbExpress\Utils. This is a very nice but mostly unknown command line parser which I can definitely recommend.